Evac+Chair® Evacuation Equipment Assists In Emergency Transport Of Injured Or Immobile Patients For Medical Aid. Evac+Chair® Evacuation Equipment is constructed with aluminum, fabric, nylon, polycarbonate, and vinyl materials for long lasting durability and strength. Emergency Bracelets automatically become a hands free flashlight and activate an audio alarm and strobe light signal to alert responders to evacuee's location if they become immobilized. Stair Chairs feature front and rear lift handles for locations with difficult access and safe controlled descent or ascent of patients. 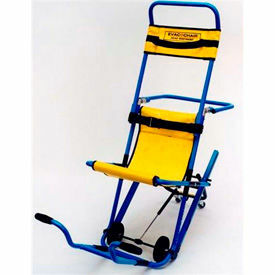 Patient Transfer Seats are portable devices for lifting incapacitated persons where self-transfer is difficult. Rescue Mats and Sleds provide quick and easy one-person operation for transporting mobility-impaired individuals. Rescue Sheets feature cross straps sewn across the full width of sheet to provide extra security on a rough surface. Available weight capacities for chairs are 350, 400, 660, and 900 lbs. Dimensions vary per model. Mobility Aids Provide Safety And Security To Elderly, Disabled, Handicapped And Physically Impaired Individuals As They Sit Or Stand. 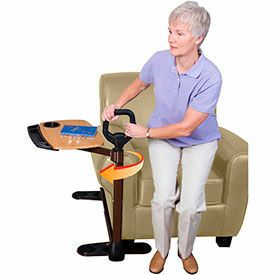 Mobility Aids are made with high quality materials for long lasting durability and dependable use. Variety of living room mobility aids available to provide safe and secure assistance for sitting and standing from sofa or chair. Selection includes Assist-A-Tray, Couch Cane Swivel Tray, Couch Cane with Organizer Pouch, EZ Stand N Go, Lever Extender and Recliner Risers. Great Grips doorknob assists also available to provide pain free turning. Dimensions, weight capacities and package quantities vary by model. Auto Mobility Aids Provide Ergonomic Support And Assistance To Individuals With Limited Movement When Getting In And Out Of Vehicles. Auto Mobility Aids are made from aluminum or nylon materials for long lasting durability. Metro Car Handle and Handy Bar styles fit door striker/door latch for extra support while sitting or standing. Rubber handle provides secure grip. Automobility Solution includes both support handle and swivel seat cushion to provide additional assistance when transferring from the car. Looped CarCaddie buckles around the top of the window frame to provide additional leverage and stability. Weight capacities are 250, 350 and 500 lbs. Dimensions vary by model.